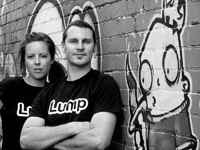 Lump Sculpture Studio is said to be one of Melbourne based artists Christo Vassallo and Timothea Jewell’s greatest work of art. Lump's quintessentially Australian artworks for outdoor areas are custom made from Christo and Timothea’s unique designs and produced in the company's Abbotsford studio. Drawing together diverse practical and theoretical backgrounds in art and design, the artists have developed in Lump Sculpture Studio a unique approach to fusing modern design with old fashioned craftsmanship, achieving striking and unparalleled works of art. Deriving inspiration from broad influences across art and architecture, their work embodies the desire for unique expression while focusing on the preservation of hand-crafted quality. The application of rigorous research in material durability in outdoor environments, along with the team's ability to adapt designs to a range of landscapes has seen Lump enjoy relationships with prominent architects and cutting edge interior, exterior and landscape designers, in addition to their private commissions. In addition, Lump has recently had the honour of exhibiting at the RHS Chelsea Flower Show for the second time. This year the artists contributed to Fleming's Nurseries Australian Garden exhibit, previously a Silver Gilt Medal winner, and earning a Gold Medal in 2008's excellent selection. They have received due accolades with numerous Gold Medals in Australian shows, as well as the satisfaction of collaborative and solo exhibitions, and a presence in myriad private collections across the country. As Lump Sculpture Studios, Christo and Timothea are continually inspired by the chance to envisage and create art for diverse and international audiences.